There is no good reason to get a tattoo during pregnancy. Although the risks appear to be small, the consequences could be adverse for your baby. You are better off waiting until after your delivery to get that statement tattoo you wanted to mark your pregnancy. A wise rule is not to use or do anything in your pregnancy unless it is benefits you or your baby's well-being. The following are the potential risks of getting tattooed that could affect the health of you and your baby while you are pregnant. The biggest risk of getting of tattoo is an infection from contaminated tattoo ink, the water used to mix the ink, the inking needles, and other supplies. According to the Mayo Clinic, these materials have the potential to pass on blood-borne diseases to you. Tattoo infections include hepatitis, HIV, tetanus, and other organisms. They could pass through your bloodstream to infect your baby and result in adverse complications. You could become very ill and need high doses of antibiotics and might lose your baby. Why take the chance? There is no information about whether the ink from a tattoo can reach your baby. However, there is some evidence that tattoo ink can penetrate into deeper layers of skin and might enter your lymph nodes. Therefore, there is the possibility that the ink could reach a baby through this route, so, again, why take a chance. In June 2015 the journal Obstetrics and Gynecology reported a case of a heavily tattooed woman with cervical cancer. Her PET scan showed abnormal pelvic lymph nodes, which suggested her cancer had spread. The pathology of her subsequent hysterectomy specimen found tattoo ink instead of cancer in her nodes. Tattoo inks can cause a local skin allergic or inflammatory reaction. This could be even worse if the ink is black henna. 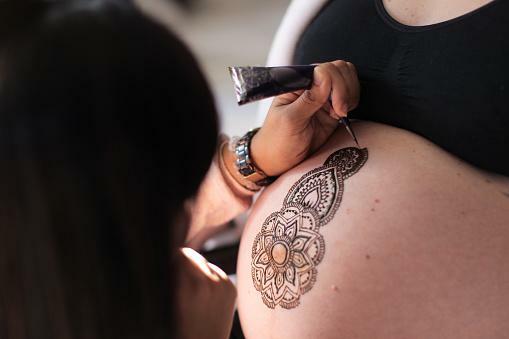 Never apply black henna to your skin or hair during pregnancy. The para-phenylenediamine (PPD) added to natural (red) henna to make it a black dye can cause severe local skin or systemic allergic reactions. A systemic reaction could harm you and your baby. There are concerns about the safety of an epidural to a pregnant woman with a tattoo on her lower back. The question is whether there is a risk that the epidural needle could transfer tattoo ink into deeper tissues, spinal fluid, or spinal cord during the procedure. According to the Mayo Clinic, however, there is little evidence this is a problem, so a tattoo on your back should not prevent you from getting an epidural. If you get a tattoo on your back, discuss the issue of managing epidural needle placement when you go into labor with your OB doctor and anesthesiologist. Some pregnant women might want to get an elaborate tattoo on their belly. Don't forget that if you have to get a cesarean section to deliver your baby, your tattoo might be distorted by the incision and healing. Your incision could also get infected or heal with a visible scar or keloid in the middle of your tattoo, and you might no longer like its appearance. That belly tattoo that started out just the way you wanted it might stretch as your belly grows with your advancing pregnancy. There is no telling what it will look like after your delivery. In addition, if you get stretch marks, they will have faded areas which will mess up the pattern of your tattoo artwork. If you have loose skin anywhere after you lose some or all of your baby weight, you might be surprised and unhappy with the wrinkled look of your previously smooth tattoo. There is also always a chance the ink might look faded because of the loose skin. If you put weight on your hips and thighs during your pregnancy, those areas might suffer the same fate. The Food and Drug Administration (FDA) advises you consider how safely the tattoo artist operates his business. If you insist on getting a tattoo while pregnant, be sure to go to a well-known, reputable artist. Make sure he/she wears sterile gloves, uses sterile mixing water and single-use needles, and that the ink and other supplies are also sterile. Also be aware that the FDA states tattoo inks "contain pigments used in printer toner or in car paint," which could be harmful if they reach your baby. In addition, note that you and your baby are also at risk if you use do-it-yourself at-home kits. It is best to put off getting that pregnant statement tattoo you so desire. Although the number of risks appear to be small, there is still not enough known about the effects of getting tattooed during pregnancy. If you are one of the unlucky women to get a severe infection or allergic reaction, you will regret getting one while you were pregnant. Be sure to discuss this topic with your doctor before you make a decision.